Linguaviva prepares students for degree programmes with selective entry which require an admission test: Medicine, Veterinary, Dentistry. Please check also our general outline of Italian Higher Education System. First part: Italian for academic purposes. The programme is designed to help students achieve the academic Italian language requirements to access Italian Universities. The course will provide students with the language and study skills needed for the Italian examination which is a mandatory requirement for international students applying on Bachelors Degrees in Italy. The course will teach following skills: comprehending academic texts, writing and making oral presentations, discussing ideas or information taken from a scientific text, independent learning skills, vocabulary expansion. The course curriculum is tailored to the fields the students plan to study at the University and to the exams they need to take to be admitted to a particular department. Students are given a specific training for scientific subjects as as Math, Physics, Biology, Chemistry, Logic etc. 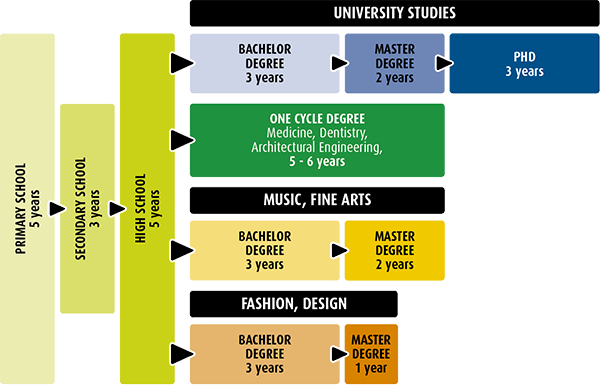 according to the degree course chosen by the student. The course is structured according to the indications given by the Italian Ministry of Education on the content of the test. In the courses students will learn about how the exams works and they will get plenty of practice using the types of questions they will see in the exam. Student will exercise also on past exam tests. Tuition fees are reasonable compared with other countries. Studying at universities and attaining a very good higher education between 1000 euro and 3,500 euro per yesr since this varies from one universitiy to another and also depends on the chosen course of study. Private universities area clearly much more expensive. To be admitted to italian University students must have satisfactorily completed High School with a minimum of 12 years education.